This workshop adopted the system of commenting and tagging developed on the Japanese online community called Nico Nico Douga, which has a particular structure in the way it has proceeded from its inception. Nico Nico Doga is a Japan’s largest video-sharing site with a different management system from Youtube. The highly interactive and user-oriented design of the site has given rise to a space for new (remix) expressions beyond existing categories, fields and professions. In the workshop, different exemplary amateur practices in diverse fields are collected and presented. 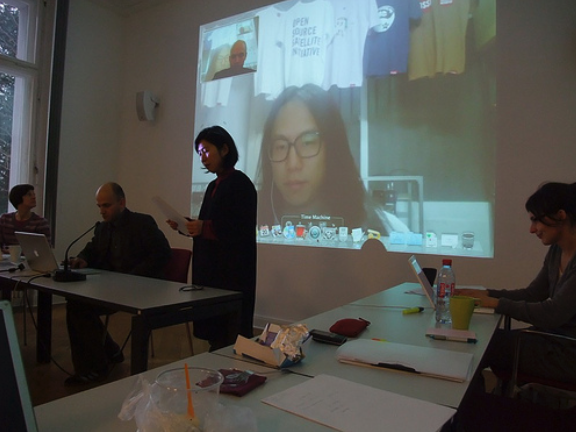 During the presentation, participants are expected to add comments on the examples of amateur practice via the Internet live stream, or manually. The process of commenting – like the way people do on social network websites– aggregates combinations of words, which may be indicative of a new constellation of thinking regarding the emerging notions and concepts of amateur. Here comments can be related to the examples as well as to previous comments. After the presentations, all the comments will be collected and discussed, and participants are invited to produce new tags out of them to consolidate their knowledge.